Government assistance is available to those living in poverty, but making ends meet is difficult even with that support. For people living in or near poverty, no amount of careful budgeting can account for all of the emergencies or unforeseen events that may occur. A mother of two, working full time on the minimum wage would likely come up $589 short every month. For those in poverty, financial margins are already thin or nonexistent. When safety net programs are underfunded or eliminated, there are very real consequences for people who are one life event away from financial ruin. Struggling families are not simply left with the lowest quality and least healthy, but often only left with the most costly goods and services, like convenience store shopping and check cashing. According to a recent Pew Research Institute poll, many Americans, especially the most financially secure, believe that public assistance creates a life of ease for those who need help.3 However, at some point in people's lives they will depend on some kind of assistance. Four out of five Americans will economically struggle through joblessness, near poverty, or need some kind of aid to get by.4 Throughout this report, we will show that the negative perception toward families in need is unfounded, starting with an example monthly budget. 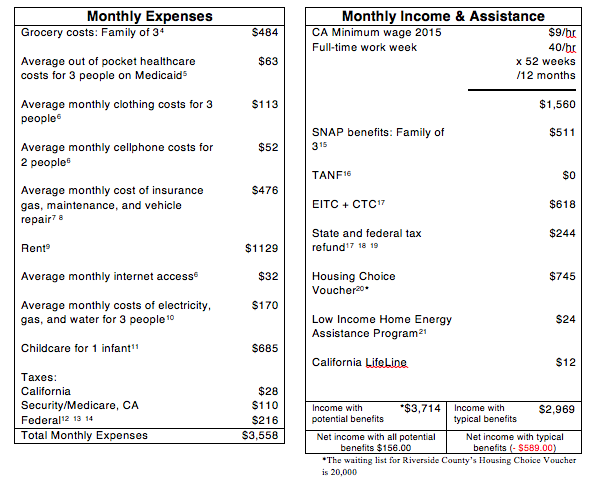 The two charts on the following page are model ledgers that reflect the monthly income and expenses of a Riverside, California minimum wage worker with two children, one an infant and the other of school age. In California, the percentage of those in poverty has risen from 15.8 percent in 2010 to 16.4 percent in 2014, with a peak of 17 percent in 2012. A single mother of two, working full time at the minimum wage comes up $589 short every month – or $7,068 a year. If the minimum wage is raised to $15/hour this mother would be making $1,040 more a month. While significant, her other assistance levels would be reduced, resulting in a net gain of $657, allowing her to barely break even on her monthly bills. Without a raise, this mother would have to work 534 more hours a year, 10 more hours a week, or an hour and a half extra each day to break even. Many programs have strict rules and lack adequate funding, making benefits difficult to access. Even poverty level wages are not enough to qualify for certain assistance benefits. One in three California families living in poverty do not receive Temporary Assistance for Needy Families (TANF). A full-time, minimum-wage worker does not qualify for TANF. In Riverside County, Section 8 housing assistance only has funding for 8,500 families, while 20,000 families are on the waiting list. Having no bank account, caused by an inability to meet requirements from banks for accounts, or having limited access to banking products costs the poor more to handle their own money. According to the Federal Deposit Insurance Corporation (FDIC), 57.5 percent of the unbanked say they do not have enough money to put into an account or maintain one. Payday lending, an expensive form of banking used by the working poor, remains a costly option for alternative banking throughout Riverside County. In the cities of Riverside, Moreno Valley, and Perris 51 payday lending businesses are in operation. In 2013, it was widely reported that one of the largest minimum wage employers in America provided their employees a sample budget claiming that workers could find themselves with as much as $800 in extra spending money after paying for necessities.28 A sober examination of the real figures tells a different story. A single mother working at the minimum wage and receiving government assistance can end the month typically $589 short of the income she needs to cover rent and put food on the table. There are persistent and unseen costs to being poor that the economically secure do not recognize. For the wealthy, their perception of low-income people is largely negative. More than half of the most economically secure Americans believe being poor is easy due to government assistance.3 As of 2014, 48.2 million Americans were living in poverty, including an estimated 392,000 Riverside County residents.2 While tens of millions of people struggle to get by, many well off Americans think their tax dollars subsidize a comfortable lifestyle for struggling families. The realities of being poor conflict with the common perception of being poor. A minimum wage paycheck cannot support even a modest size family. While there are government programs designed to help those that need it, direct cash assistance programs like Temporary Assistance for Needy Families are reserved for income levels below that of a full-time, minimum-wage earner. Food assistance, tax credits, and housing support all come with their own set of requirements and constraints. These programs have been underfunded by the federal government for decades, resulting in highly restrictive application processes and in some cases long waiting lines. Before restrictive changes were made to TANF, its predecessor – Aid to Families with Dependent Children – was capable of including 96 percent of Californians living in poverty. 25 Today, only 34 percent of Californians living in poverty are included in its rolls.25 Without these support programs, many low-income families find themselves completely unable to make ends meet. Our social safety net helps keep 39 million Americans out of poverty and is a critical survival tool for the poorest Americans.29 While Americans give generously to charity, charitable contributions are not enough to completely address the depth of poverty in this country. In 2014, national giving totaled $358 billion.30 This money was spread across all charitable efforts including causes that do not address poverty at all or address it only indirectly, such as animal welfare groups, cultural institutions, and houses of worship. To put the total of these giving efforts into perspective, in Fiscal Year 2016, Social Security will spend $785 billion in Old-Age and Survivor’s Insurance alone.31 Additionally, the federal government spent $370 billion on the Earned Income Tax Credit, Temporary Assistance for Needy Families, Supplemental Nutrition Assistance Program, Section 8 housing assistance, and other poverty relief programs in 2014.32 Government programs are necessary to deal with the full scope of poverty, but support for those programs has been stagnant for decades and struggling families are being increasingly asked to do more with less. Direct cash assistance to families in need has been on a steady decline. Many states have allowed benefits to be reduced through inflation or have outright cut them.33 In addition, states have diverted TANF funding for direct cash assistance to other programs. Congress has not taken steps to ensure that TANF funds, the most common type of direct assistance, keep pace with inflation. In addition, as a fixed grant, TANF cannot respond to rising demand during economic downturns and states often cut from it to meet budget shortfalls. Since 2010, adjusted for inflation, TANF benefits in 30 states had declined in purchasing power by 20 percent from 1996 with only a handful of states marginally increasing their benefits by 2013.34 For the overwhelming majority of families who need help, the support they need has been on the decline and that trend continues. In order to qualify for CalWORKS a minimum wage employee would have to be unemployed or working part time and making below $13,968 annually. The example used in the executive summary of a full-time, minimum-wage worker would not qualify for CalWORKS. CalWORKS is meant to be a supplement that gives families breathing room to work their way into economic stability. However, in California a person can only receive the benefit for four years, after which they are cut off no matter their economic situation. In addition, California spends less than half of the money it receives for TANF on direct assistance to families in need. The “basic assistance” cash benefit portion of CalWORKS amounts to 46 percent of the program’s budget.36 CalWORKS is explicitly meant to pull people above the poverty line, but restrictions, diversion of funds to other programs, and underfunding mean that many workers and families living on the edge receive little or no help at all. SNAP helps low-income families put food on the table. Currently, the benefit our example family of three can expect to receive is $5.68 a day per person, or less than $2 per meal.16 However, benefits are reduced based on monthly income, a family's housing expenses, and other factors. Many families receive far less than even a few dollars a day of assistance. Significant portions of Section 8 funding are dedicated to those living in deep poverty: families at or below 30 percent of the area median income (AMI). Most Housing Choice Vouchers, 75 percent, must go to those with very low income.43 While the program fulfills an urgent need in this manner, it also leaves many struggling families waiting months, even years to receive help. If a low-income family met the strict requirements of Section 8 for Riverside County, they would join a long waiting list. The County currently has funding to provide vouchers for 8,500 families, and approximately 20,000 are on the waiting list.44 It is unlikely that a working, single mother would find her way to the front of the list given Riverside County Housing Authority’s preferences and backlog. The preferences include: veterans or widow(ers) of a veteran, families whose head of household or spouse is 75 years of age or older, homeless foster youth who have aged out of foster care, families referred to the housing authority for admission through the Family Unification Program, and other criteria defined by the housing authority. In addition, families are still expected to contribute part of their earnings toward housing.Even the families who receive this assistance often endure long periods of waiting before they are selected and granted support. The Earned Income Tax Credit (EITC) and the Child Tax Credit (CTC) form vital relief for families who, despite working, live in or near poverty. These credits can zero out a family’s federal income tax liability or provide a refund if little or no taxes are owed. However, a worker’s federal taxes are still deducted throughout the year, and workers still pay much of their income towards state and local taxes, including but not limited to sales tax. Until that time, their money is held in what is essentially a zero interest savings account. The EITC is calculated using a formula based on income thresholds. The Child Tax Credit phases in at incomes starting at $3,000 a year. A family reduces their tax liability by up to $1,000 per child. In addition, the CTC is a refundable credit. For example, a family with two qualifying children and a tax liability of $1,500 may receive the $2,000 child tax credit as a $1,500 reduction in their tax liability and a $500 refund. SNAP, the EITC, and the CTC help those who need it most, these programs only trail Social Security in their effectiveness. In California, more than 1.2 million people were kept out of poverty by these tax credits each year between 2011 and 2013.45 Locally, one in four Riverside County residents filing a tax return received the EITC.44 Most of these recipients are working full time. Tax-return data for 2014 showed that 62 percent of EITC payouts in California went to full-time workers.46 In addition, research shows that the EITC and CTC improve the economy, promote job creation, and improve the health of children and mothers.47 However, as effective as these credits are, low-income workers need a way to access their money when life events happen, not just during tax season. Also, the poor lose income during the year to inflation while waiting for earnings to be returned to them. Furthermore, 3.7 million working Californians could be pushed into, or further into, poverty in 2018.48 A change to the CTC earnings calculation and provisions in the EITC for married couples and those with three or more children are set to expire in 2017. If these provisions expire, many people receiving these credits now will lose significant portions if not all of them. Mobile phone and landline services are not luxuries in today’s economy. The Federal Communications Commission has a program to help close the communication gap between wealthy and low-income families. The federal LifeLine program provides low-income households with subsidies to access the essential communication networks that connect everyone with their daily needs. Households at or below 135 percent of the federal poverty line, or those participating in select federal assistance programs, are eligible to apply for a $9.25 subsidy applied toward landline or wireless phone service. California has its own LifeLine program. It offers more help, up to $12.65 for landline and wireless services, as well as a discount of up to $39 for service connection or conversion.49 California’s plan serves more users by including participants in state programs like the Women, Infants, and Children Program (WIC). However, enrollment is cumbersome and is not coordinated with other income assistance programs. More people could easily be served by verifying LifeLine eligibility with other poverty supports. In addition, while help is welcome, it is too limited. California goes beyond the federal support level by 37 percent but the program is still limited to one service per home and would only cover a quarter of the communication costs for the family in our example. For most poor people this is not a choice. According to the FDIC and Census data, more than half of those surveyed - 57.5 percent - do not have a bank account because they simply do not have enough money to hold in an account or cannot maintain balance requirements. Furthermore, nearly one in three - 30.8 percent - of those without accounts say that high and unpredictable fees prevent them from opening one. Without a checking or savings account, many resort to fee-based check cashing. Though the fees are small, typically 2 to 3 percent, they still take away precious resources that could be used to support the family.26 Someone working full time at the California minimum wage would lose $345 a year, or 2 percent of their income, in check cashing fees. While the poor and unbanked are routinely charged for the use of their own money, they cannot save for the future. This further exacerbates a cycle of debt and poverty. Financial planners recommend putting aside 10 percent of your monthly salary for retirement.54 For someone on the minimum wage, they would need to find $156 a month in a budget already stretched to its limits. Many underbanked people use the overdraft protection, one of the most common checking and savings account features, as a form of short-term borrowing. Overdraft protection allows charges to be made against insufficient funds for a fee. Banks present overdraft protection as a safeguard to be used on rare occasions. The reality is significantly different; Consumer Financial Protection Bureau data shows that those who overdraft are likely to do so multiple times and the average annual cost in overdraft fees is $225.55 For unbanked and underbanked people, much of their own money is spent servicing high-interest loans and fees. The poor pay more when they have to shop at convenience stores instead of bigger markets. Items at corner stores often carry higher price tags versus supermarkets. Small neighborhood stores do not handle the same volume, typically pay more for real estate in urban settings, and these factors can result in higher prices.56 United States Department of Agriculture studies found that grocery stores were 4 percent cheaper than corner store counterparts on a selection of goods. Comparisons of inner-city corner stores have shown as much as a 7 percent increase for both food and non-food items. Milk is 13 cents more per ounce, 5 percent higher, at a convenience store as opposed to a grocery store and even less expensive at many larger chains. Cereals were found to be significantly more with corner store shoppers seeing a 25 percent price increase. Bread is roughly 10 percent more at a convenience store.57 For people who live too far from grocery or larger discount stores, they pay a premium for the food they buy. The increased costs for low-income consumers – in terms of time and money – is exacerbated by the methods poor people use to shop for food. Department of Agriculture research shows that only 68 percent of SNAP recipients use their own vehicle to shop compared to 95 percent of higher income households.58 SNAP households are nearly 10 times more likely to borrow someone else’s car to do their food shopping, and six times more likely to walk, bike, or use public transportation.58 These substitutions mean waiting for someone to take them to a store or lend them their car, waiting for a bus or a train, or spending more time biking and walking. Existing programs meant to help the poor are effective but underfunded, with too many restrictions on eligibility. Focusing on improving and expanding these programs would be the most efficient way to fight poverty and would require no new infrastructure or bureaucracy. These efforts should begin with paying every worker a living wage. Americans value hard work. There is no better way to live up to that ideal than ensuring that no full-time worker lives in poverty. Make sure no one has to choose between their work and their family: Full-time workers living in or near poverty have to make tough decisions when they or someone in their family becomes ill. Even if their employers allow them to miss time for work, the poor can ill afford missing even a day’s worth of pay. Requiring businesses with at least 15 employees to provide sick days will ensure that no one has to choose between family and financial responsibilities. In addition, when employees feel compelled to work while they are sick it can jeopardize the entire workplace if their illness is contagious. Passing the Healthy Families Act, which I am a cosponsor, will help millions of workers tby allowing them to earn sick time. Paid sick or family leave is an idea with bipartisan support. Senator Rubio has proposed an idea that would give businesses that provide paid family leave a tax break. His plan is based on the Strong Families Act, introduced by Senators Deb Fischer and Angus King, a Republican and an Independent respectively. This idea enjoys bipartisan support because it is fair, reasonable, and makes economic sense. Senator Rubio's plan is a great start but does not go far enough. 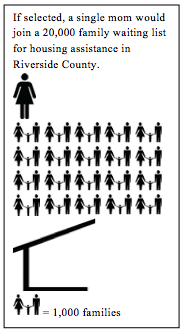 Reform & Strengthen the Earned Income Tax Credit (EITC) and Child Tax Credit (CTC): The Earned Income Tax Credit keeps millions of adults and children above the poverty line every year.60 Research shows that increasing the EITC for women with children boosts employment among this group significantly.60 As effective as the EITC is, it does not reach enough people. Lowering the eligibility age and expanding the EITC for those without children would significantly help young people at a critical stage in their working lives. Expanding the EITC to include childless workers has bipartisan support and appeared in Congressman Ryan’s budget proposal last year. In addition, ensuring that the EITC and CTC keep pace with inflation and making them permanent would secure the undeniable gains they provide to workers and low-income families. Giving families the option to change how the EITC and CTC are distributed to them will make it easier to manage tight budgets. Allowing families to access up to half of their credit starting on July 1 of the same filing year, will make it easier to set money aside for contingencies and decrease the need to use predatory financial products like payday loans. Fully Fund Child Care Subsidies for Working Families: Through the Child Care and Development Block Grant and the At-Risk Child Care program, families can get help to pay for the high costs of childcare. Preserving this funding is essential and I have signed on to letters with my colleagues calling for the necessary appropriations. In California, the average annual cost to care for an infant and a school-aged child is more than $10,000.12 To put that in perspective, the average annual cost of in-state tuition for a four-year California college is $9,173. 61 However, according to the Department of Health and Human Services, only one in six children who are eligible under federal standards for assistance actually receive it. Providing quality, affordable childcare for working parents would ensure that no one would have to give up their job to stay home with their child. End the Ineffective Block Granting of TANF: Before it was a block grant program, Temporary Assistance for Needy Families was significantly more effective at including California’s poorest families.25 Allowing states to control block granted funds intended to assist those in poverty has resulted in states using those funds to cover their own budget shortfalls. Returning TANF to federal government control would ensure that money meant for struggling families actually reaches them. Block granting has given states wide latitude to use their funds and matching funds, known as Maintenance of Effort, for programs tangentially related to assisting poor families. This autonomy has led states to shift funds into areas of their budgets that suffer during periods of shortfalls. Fully Fund SNAP: The Supplemental Nutrition Assistance Program is one of this country’s most effective tools for fighting poverty. Every dollar of SNAP spending generates about $1.70 in economic activity.62 Effective programs like this need to be protected from efforts to “fix” them through block granting or other methods that would reduce the number of people who benefit from them. That is why I have signed on to letters with my colleagues to protect SNAP funding in the Farm Bill. Support Low-Income Students by Fully Funding Housing Assistance: Children who change schools due to a lack of housing perform worse than their peers. Underfunding has resulted in long waiting lists for assistance and many are closed to additional applicants. Families who receive assistance move less and live in better conditions. That is why I have signed on to letters urging appropriators to fully fund Section 8. Necessary support would directly combat homelessness and help children of low-income families to close the achievement gap in school. Make Broadband Service Truly Accessible to Low-Income Families: Broadband service is essential to participating in today’s economy. There is a deepening digital divide the FCC needs to address. Currently, less than half of Americans with annual incomes less than $25,000 have some form of broadband service.63 The Federal Communications Commission implemented its Lifeline program to provide subsidized telephone and wireless service to low-income Americans who would otherwise be unable to afford the essential services.64 The FCC must ensure through clear rulemaking that providers are meaningfully implementing the Lifeline program. Ensuring basic high- speed internet access would give struggling households more equal footing in the job market, allow children to do school work, and grant access to all arenas where the internet touches our lives. I plan on sending a letter to the FCC outlining my suggestions as they work to issue the rule that will make this a reality. Require Banks to Offer Low-Income Financial Products: Those in poverty are continuously charged for the use of their own money through payday lending, check cashing fees, and banking charges. Requiring banks to offer no-fee, flexible financial products to low-income Americans would alleviate financial stress for millions of unbanked people. In addition, these products would create new, loyal customers who would be making their way toward financial security. These accounts could be paid for by additional Federal Deposit Insurance Corporation fees. Another option is to allow Post Offices to offer basic financial products, which would give those in underserved communities broader access to low-cost banking. This can be made a reality by passing legislation like the Providing Opportunities for Savings, Transactions, and Lending Act, which I cosponsored. Low-income earners would spend much less to handle their own money if a non-profit, reputable option were available to them through the US Postal Service (USPS). From 1910 to 1967, the USPS provided low-cost savings accounts to customers. Participation peaked in 1947 with balances totaling more than $3 billion in for million accounts.65 Providing check cashing, debit cards, and savings accounts through the USPS’s nationwide network would reach people who live too far from a bank and have the added benefit of shoring up some of the Postal Service’s recent financial challenges. Ensure That Banks Are Not Taking Advantage of the Poor: The creation of the Consumer Financial Protection Bureau was a significant step in protecting low and high-income Americans alike from predatory practices. However, many banks continue to find workarounds or outright ignore guidance and rulemaking designed to protect consumers. For example, the overdraft fee continues to generate billions in revenue for banks despite laws and regulations meant to curb its use. Passing the Overdraft Protection Act would protect millions of Americans from losing money to abusive fees, which is especially important for those living paycheck to paycheck. Support Inner-City Farmers Market Programs: Combating hunger can take relatively small investments. Every year, the US Department of Agriculture uses grant money to support local farmers, businesses, and schools to bring fresh and healthy food to underserved communities.66 Congress must increase funding and expand these efforts to connect food producers with farmers markets and place fresh and affordable produce in convenience stores that otherwise lack comparable options. For a full listing of sources, visit the references page.